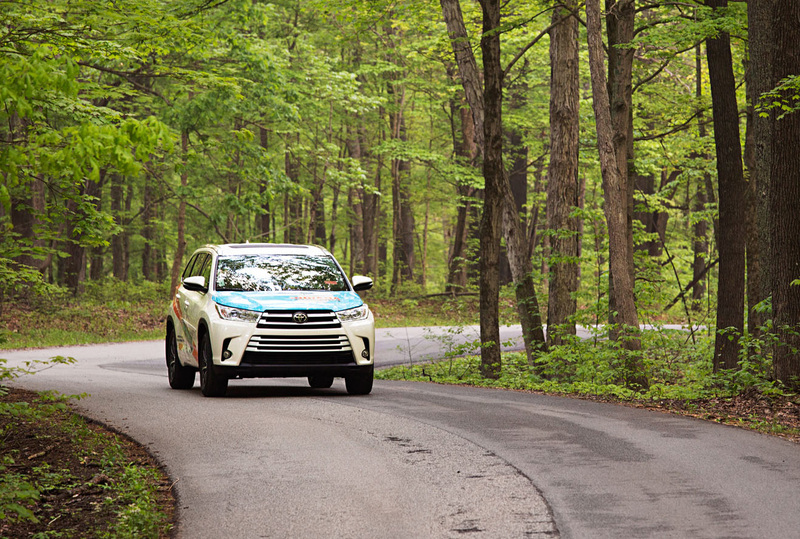 Our first-ever Road Rally goes from the Ohio River to the St Marys River through the heart of Indiana. 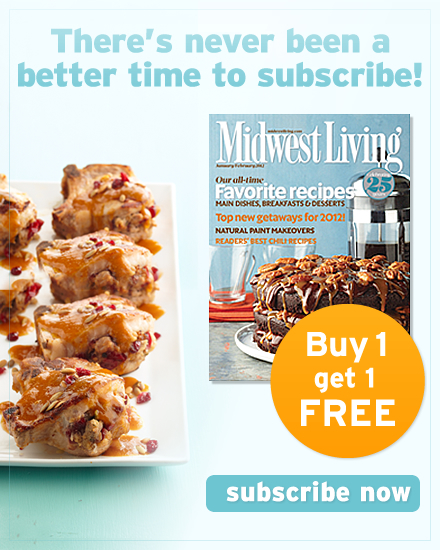 The story below appears in the July/August 2017 Midwest Living. 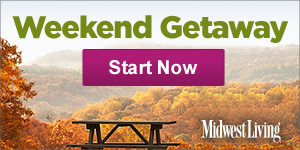 Click or tap here for a trip itinerary, more photos and videos. If you start naming great stories, you’ll quickly be talking about road trips. Chaucer. Kerouac. Eat, Pray, Love. The Griswold family. You can’t beat a heroic journey focused on a distant goal and seasoned with a few obstacles and quirky travel companions. Our staff started jonesing for all of that during a planning meeting a few months ago. 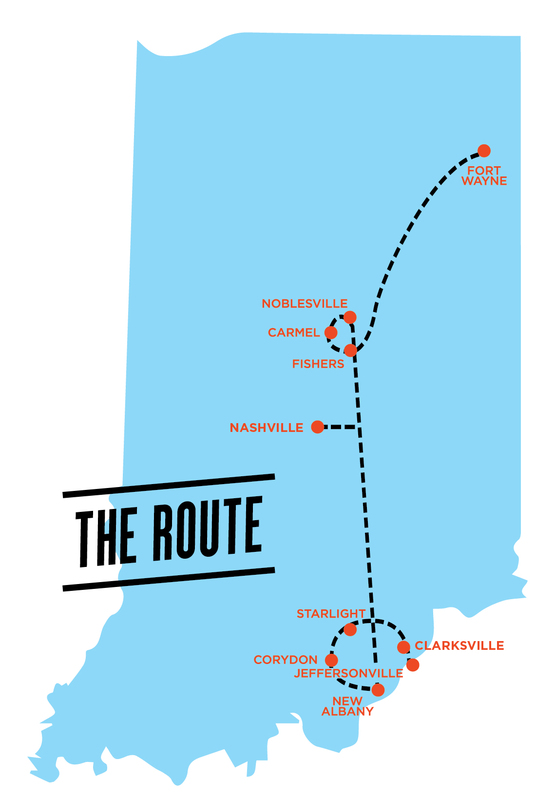 So on the spot, we declared a plan for the first-ever Midwest Living Road Rally. We got busy choosing the perfect dashboard bobblehead and arguing over playlists. Then we started wondering where to actually do this. What if—to add a little drama—someone else got to decide? The word went out: We’re packed up and ready to go. Who has a good route? It wasn’t long before the Visit Indiana team won us over with a convincing case for showing off a few corners of Hoosierland that we may have missed. So we made them an official partner and set the date for May’s Visit Indiana week. And in the tradition of all true heroes embarking on a quest, we filled the cooler with ice and headed for a town called Jeffersonville. The front yard of Jeffersonville's Parlour pizzeria. Our first stop near Jeffersonsville carried a mission: Find a lost picnic spot and resort inside Charlestown State Park, and summon a few ghosts from the Jazz Age. We wound through tulip poplars and maples, watching for evidence of Rose Island, which a 1937 flood nearly wiped off the map. An old newspaper article told us that “breeze hunters” once came here to escape hot, sooty summers in Louisville, Kentucky. The park promised picnic grounds, a dance hall and a pool—an exotic draw for working folks who rode the Idlewild 90 minutes up the Ohio River to Rose Island. Local ghosts explain all this when you turn the crank on boxes hung near the bones of old structures. The boxes send music and voices from the 1920s bouncing around the woods. On a sunny afternoon, it’s mesmerizing. But if you visit Rose Island at night, I’d leave the cranks alone. Jeffersonville has good reason to hold a grudge against the Ohio River. Many buildings in town have a line painted on the second story to show how high the flood of 1937 rose. But like many towns, Jeffersonville is reconciling with the river, and the Big 4 Bridge is a key peacemaker. The bridge (built for a railroad) shut down in the 1960s and lost its on-ramps, marooning it between Indiana and Kentucky. 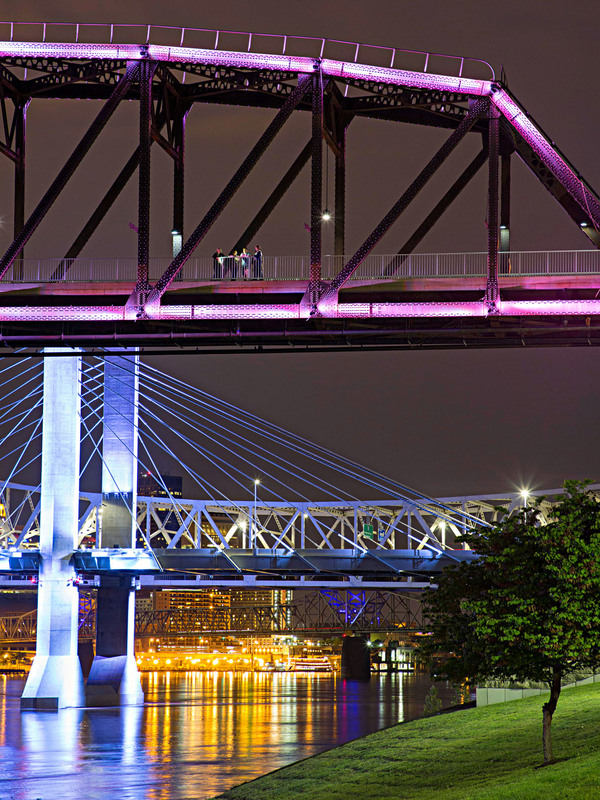 In 2014, the states got together to reopen the Big 4 as a mile-long pedestrian bridge. 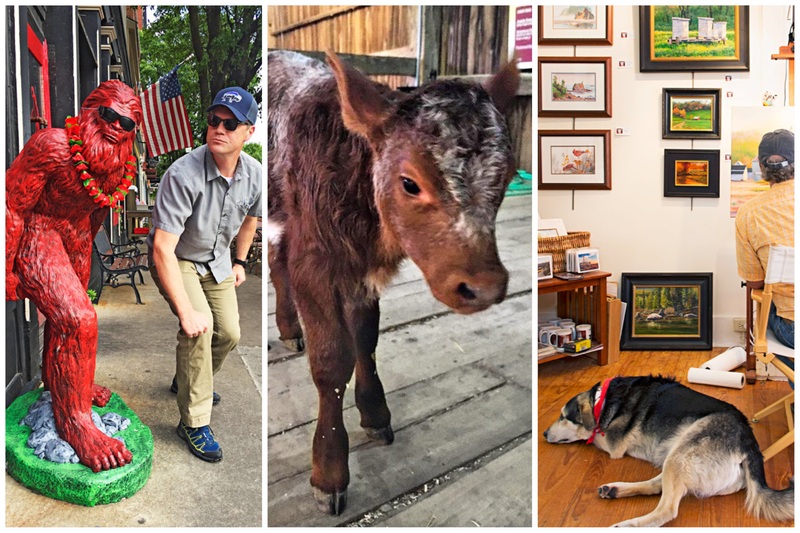 Now Jeffersonville’s renaissance is rolling with a riverside park and a music stage floating on the Ohio—plus a don’t-miss fuel stop at Parlour, a pizzeria with an Italian oven at the foot of the bridge. On the Big 4 Bridge, we met Ray, who recently retired from a job that sounds straight out of a novel: bourbon barrel-maker. We walked to Kentucky and back as he shared a few cooper’s secrets. Nobody does roots like Huber’s Orchard, Winery and Vineyards. Seven generations in, the family still works its homestead near Starlight, reimagining the business as times demand. 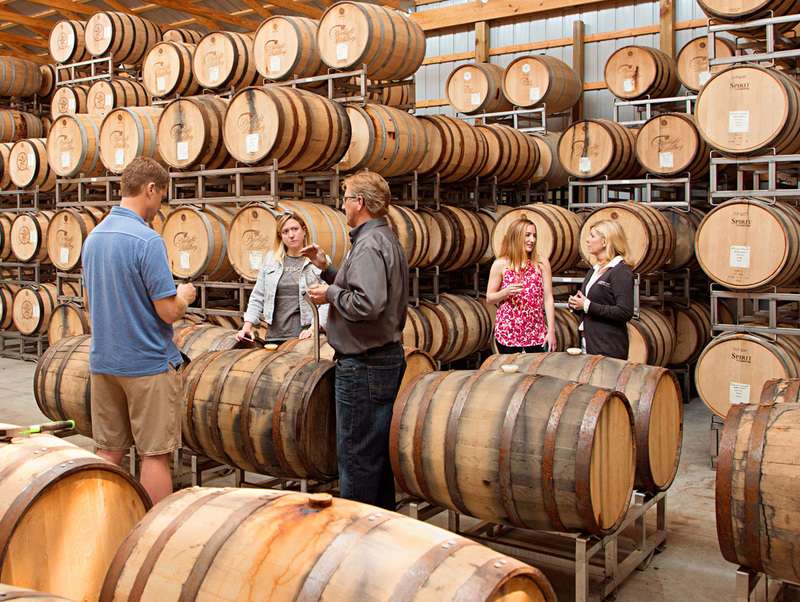 Today, the farm draws 600,000 visitors each year for U-pick produce, wine tastings and events. Plus, it offers a line of spirits from its Starlight Distillery. On tours, Ted Huber provides a fast course in the details of grain, charred oak barrels and the distillery’s steampunk valves and pipes. In Aging Barn No. 1, he pops a bourbon barrel’s plug and draws a sample. The Hubers pride themselves on what they call “grain to glass,” which means keeping every step of production on their property. “Whether it’s corn in the field or bourbon in the barrel, it’s bourbon to us,” Ted says. Haberdashery isn’t a word that comes up too often in conversation—and that’s exactly why we got excited after stumbling upon Him Gentleman’s Boutique in New Albany. 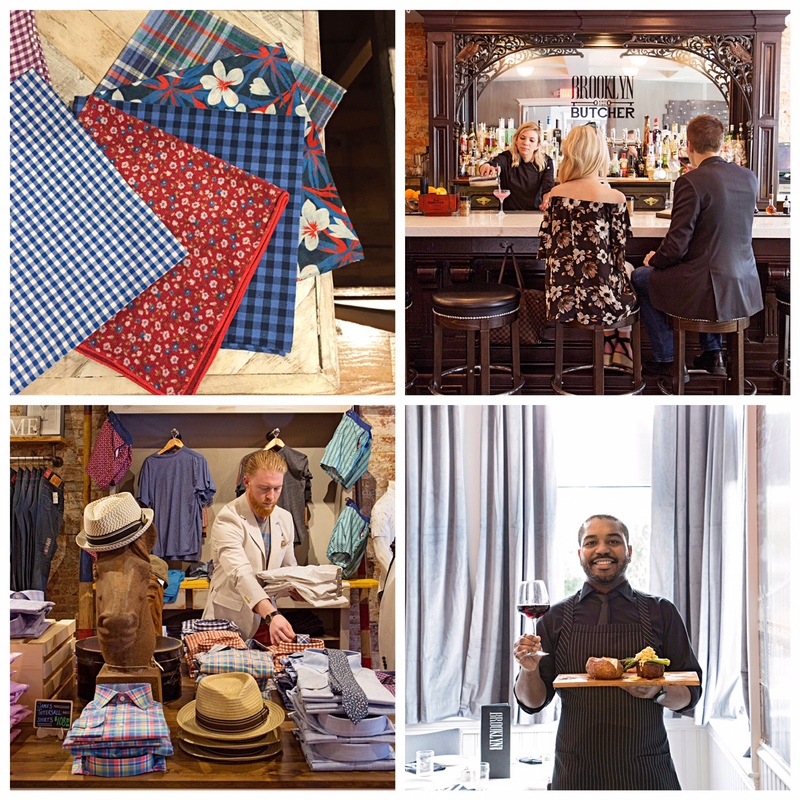 It’s a meticulously curated shop that can tempt even the most fashion-ignorant dude to buy the kind of jacket and hat you’d wear to the Kentucky Derby … or to Brooklyn and The Butcher, a couple of blocks away. This smart steakhouse features a lower-level speakeasy mixing drinks like the Highlander, which combines 10-year-old Scotch and smoked lemon juice. 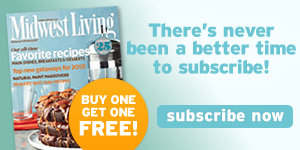 “Yes, it’s a thing,” Demi Pappas tells those who question her title of professional forager. She browses fields and forests around Fishers gathering watercress, mushrooms and more for high-end meals. Many appear in the Prairie Plates series served in spots like the covered bridge at Conner Prairie, an immersive outdoor history museum. Demi picked the salad for our meal by Chef Craig Baker from Local Eatery and Pub in Westfield. Even the bison ribeye’s peppercorn crust started with Demi’s hikes. Take note on career day, kids. 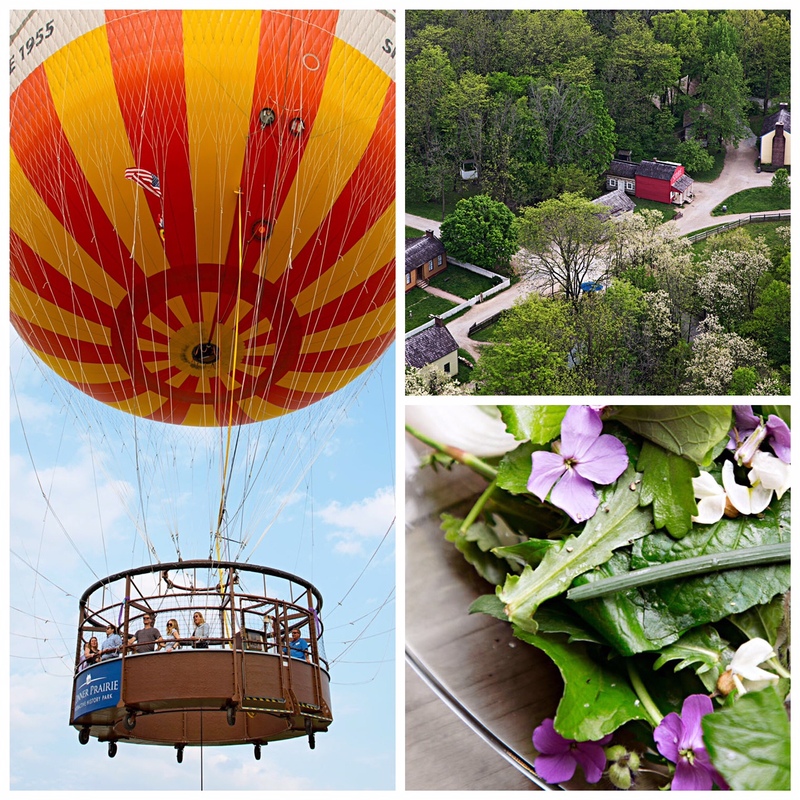 Conner Prairie’s helium balloon rises 370 feet on its tether, carrying up to 20 people in its gondola. Professional forager Demi Pappas picked the salad for our Conner Prairie meal. 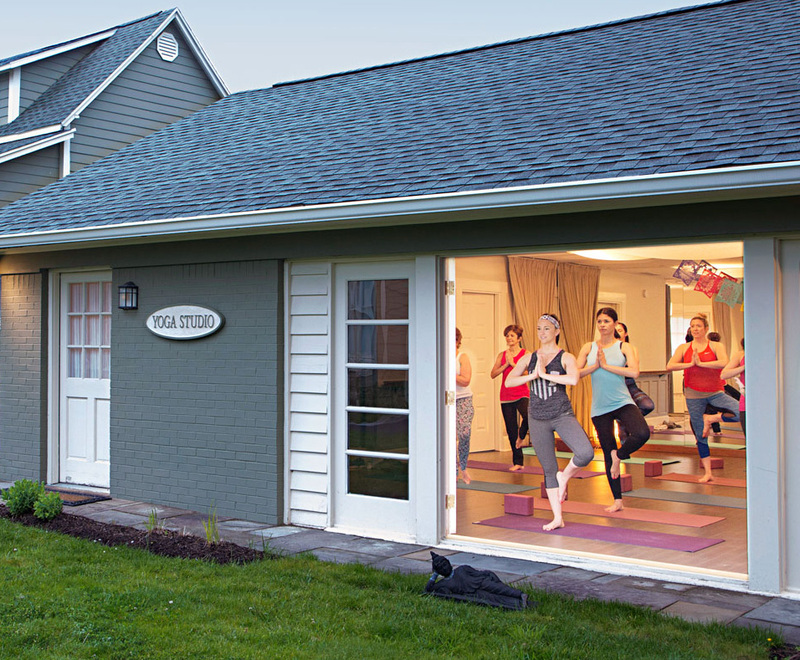 When two days on the road left us a little tight, Karen Newton brought the fix with a few tree poses at her Prairie Guest House yoga studio in Fishers. No Midwesterner will turn down a deviled egg, that staple appetizer that has graced countless Tupperware trays with divots sculpted just for eggs. So the dish has become a hot comfort food to riff on, and Matthew Nolot of Fort Wayne’s Tolon restaurant makes the leap exactly as you’d expect from an award-winning chef. His deviled eggs spiked with Sriracha and miso paste rocked our small-plate dinner. And if you’re still figuring out exactly what umami tastes like, get the three-layer chocolate cake and notice the miso mousse and bacon ganache. It’s that. egg and gravy. As they say, genius is really just making connections no one thought of before. The Red Yeti Outside the eponymous restaurant in Jeffersonville, things are always a little squatchy. Conner Prairie's Farm Nursery Pick your favorite from the barnful of adorable that includes calves, lambs and goat kids. 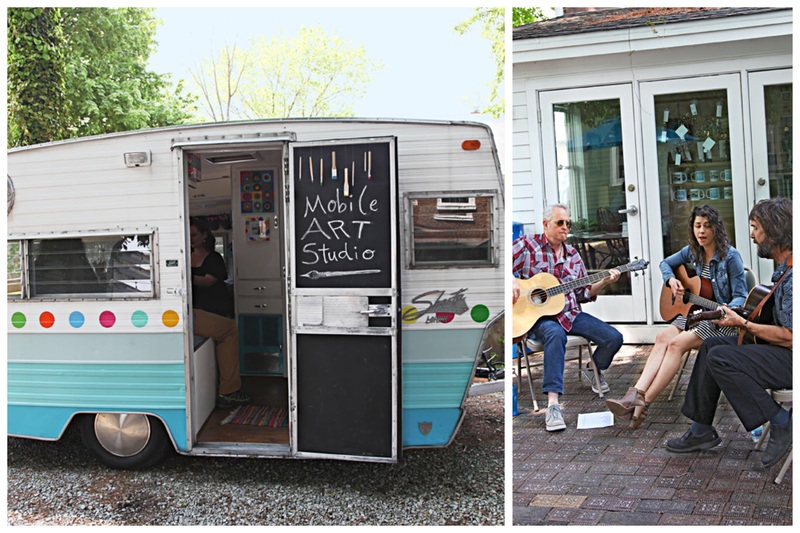 Thunder the Art Dog Bandana-clad and often napping belly-up in a studio at Nickel Plate Arts in Noblesville, Thunder offers clinics in the art of chill. 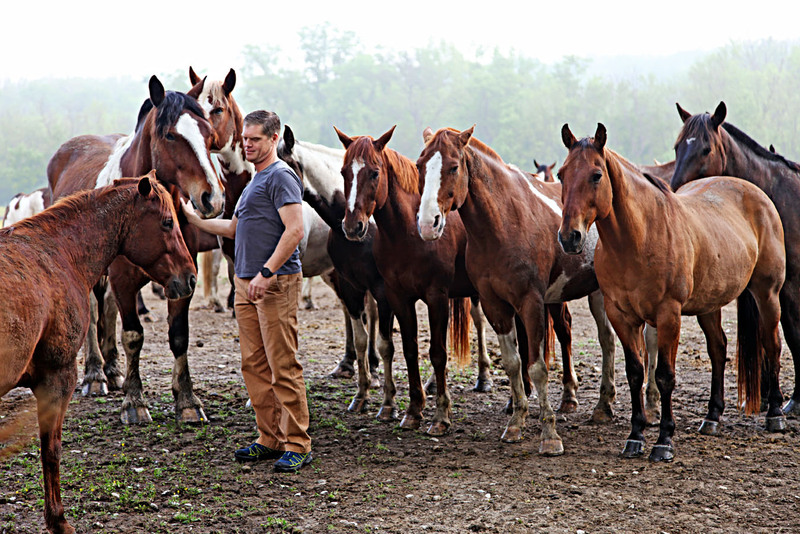 Brown County State Park, 7:32 a.m. On a pre-breakfast cruise around Indiana’s largest state park (near Nashville), we did a little horse whispering and found an overlook that makes Instagram filters redundant. Put me in, Coach—I’m ready to dive! Bringing the caravan to Fort Wayne led to some celebrity privileges. 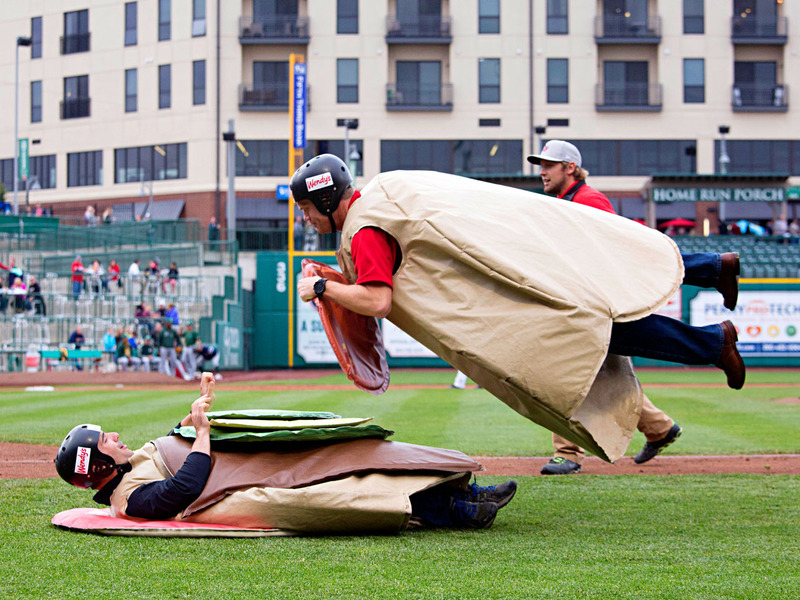 The Tincaps baseball team, for example, invited me to play Top Bun in the famed Build-A-Burger race. The Tincaps’ Parkview Field is a major story in the minor leagues, thanks to its versions of Wrigley Field’s rooftop seating and Camden Yards’ warehouse neighbors. So it was an honor to run the first-base line in a vinyl costume, stacking giant burger toppings onto a guy named Joe (playing Bottom Bun). At the strong urging of the team’s marketing intern, I finished with an epic belly flop that sent literally dozens of fans into a frenzy. Our crew made some new friends at the Tincaps game, like Mallory. 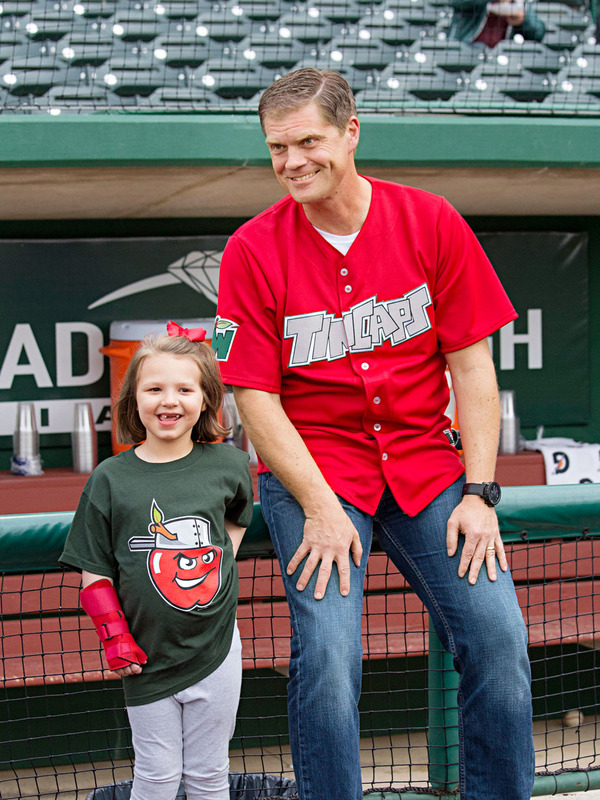 She shamelessly stole the show when we threw out the first pitch together. 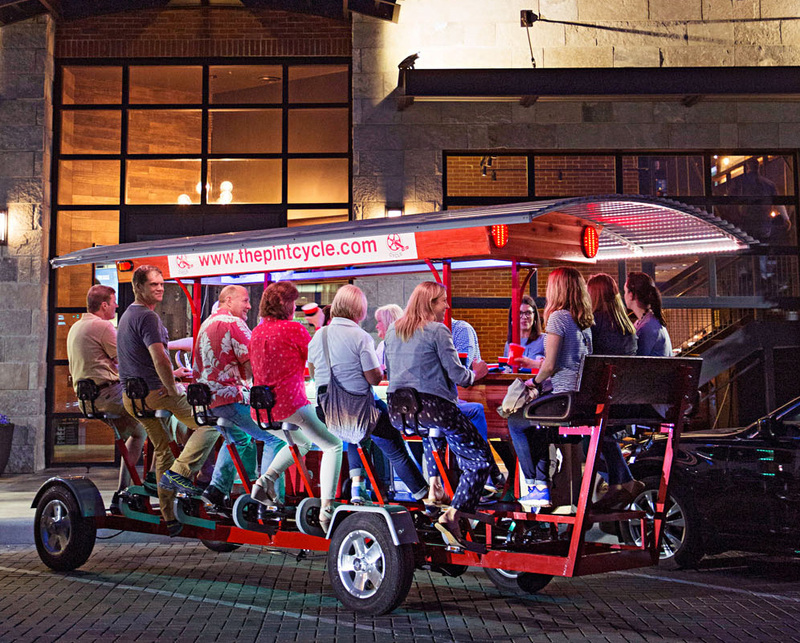 Pedal The Pint Cycle You and 15 pals power this rolling pub around the Nickel Plate District, hitting local restaurants and bars without wheels. Ride the pint cycle to Vardagen for cold-brew coffee and edgy t-shirts. 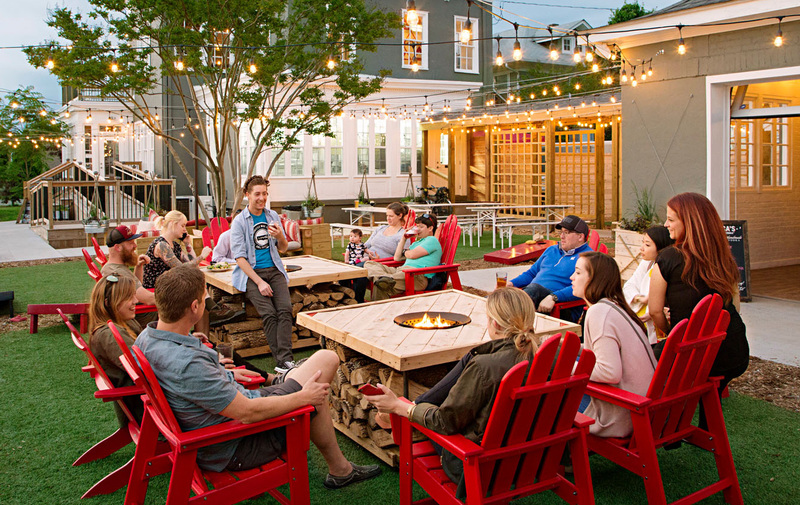 Grab a Brew at Four Day Ray Find your nightcap at a brewery whose name salutes a railroad worker who called in sick one day each week. 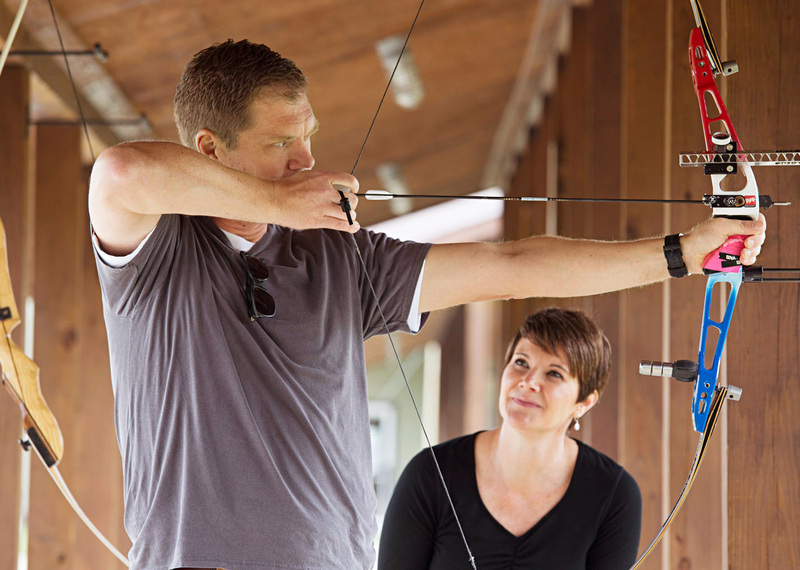 How could we not stop at Koteewi Archery in Noblesville? It has targets shaped like T. rexes and jackalopes, plus something like Ted Nugent’s idea of a golf course: a 30-station forest route filled with foam deer, bears and boars. She pulled out a red-white-and-blue bow and fired a few arrows. Was that the bow she shot in 2004? In Athens? In the Panathenaic Stadium where the modern games began? “Oh, yeah, actually it is,” she said. “Do you want to shoot it?” I did. A city that’s in touch with its river is a better city. So says Tim Hall, along with, “I’d rather do things than watch other people do things.” Our kinda guy. 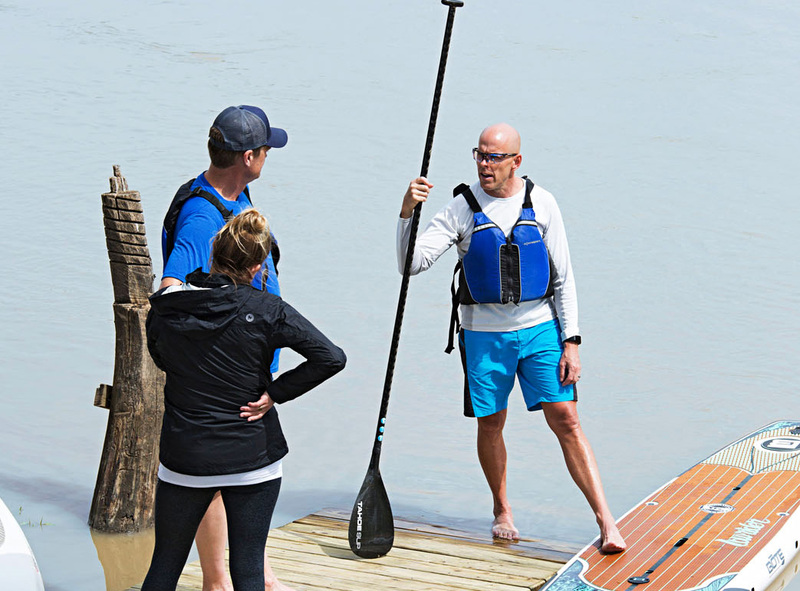 So to understand Fort Wayne circa 2017, we had to paddle the St. Marys River with Tim and his wife, Cara. We met on the dock outside the old train depot where the Halls operate Fort Wayne Outfitters. This summer, the city will bulldoze an industrial park and create a riverside park near the Halls’ depot. One better city, coming up. Every true child of the ’80s dreamed of stumbling into a drippy cavern harboring underground waterfalls and treasure. Enter Indiana Caverns near Corydon. 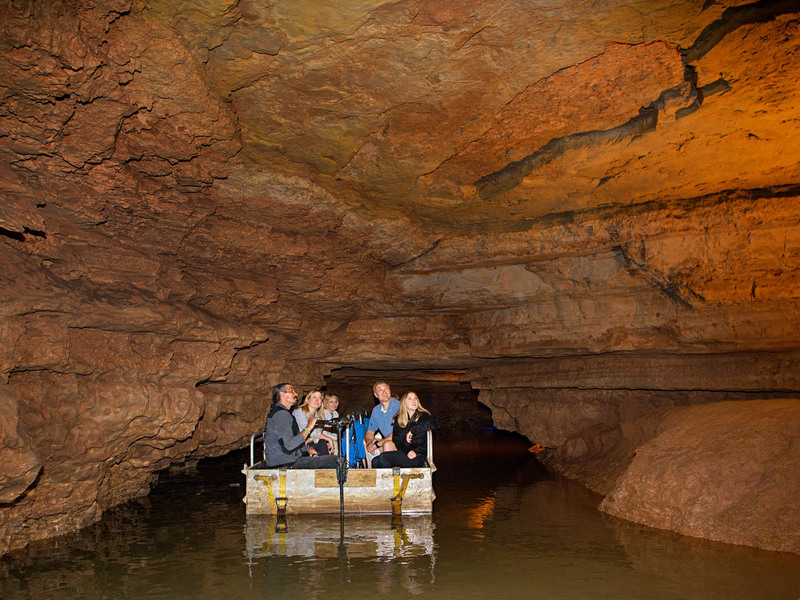 Tours start at a 40-foot cascade and follow steel walkways to an underworld boat voyage. The spine-tingliest part of the place is frequent evidence of ice age animals. Bones, claw marks and cave bears’ hibernation wallows pop up throughout, proving that at some point, this cave was easier to get into. And a lot scarier. At left is Tray, who says, "You gotta be a special kind of crazy to explores caves, but man, I dig it." Debby Ellyn An artist who captivated us by laying sheets of paper on water to pull off marbled patterns. Noble Roots A local band laying down acoustic tunes mid-afternoon under a shade tree. Caravan Classes A ’69 Shasta Loflyte camper-turned-studio, where watercolors tempted us to ponder what scene we might paint to tell the story of a journey along the Hoosier highways. Shout-out to Ed Martin Toyota for providing our rides for the week.